Muffin top, spare tyre, blubber, belly fat, beer belly - a multitude of names but they all mean the same thing. Abdominal fat. And in the summer many turn to quick fixes to get rid of it, writes Saleyha Ahsan. The problem with belly - or abdominal - fat isn't just the way it looks on the beach. It could be a sign that your health is at risk. Belly fat is around our midriff - the subcutaneous fat that we are referring to when we ask if you can pinch more than an inch and also the visceral fat around our organs, like the liver, pancreas and intestines. Last year I had an MRI scan which showed me the fat I had around my own organs and it was a sobering moment. 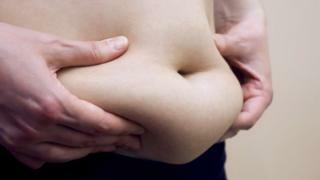 Fat around our vital organs can lead to adverse health effects. Take the test: How can I lose an inch of belly fat in four weeks? Visceral fat is believed to be more metabolically active than subcutaneous fat and has a higher turnover. If you gain weight you put it on there first - and if you lose weight, you lose it from there first. Although it is considered the more dangerous to our health, the good news is that it is easier to shift than the subcutaneous fat. But the question is how. On health and fitness websites you can see the promise of "spot reduction" of belly fat. These are the quick-fix tricks that promise to help melt fat away. But how reliable are they? The Trust Me I'm A Doctor team have done some experiments to finally get to the bottom of it. So how do you get rid of it? We recruited 35 volunteers - splitting them into four groups - along with two experts in the field of exercise and diet. All the volunteers carried abdominal fat which gave them waist sizes that put them in the danger zone for type-2 diabetes and heart disease. Fredrik Karpe, a professor of metabolic medicine from the University of Oxford, and Prof Dylan Thompson, from the University of Bath, each had to come up with two methods to try with the four groups, aligned with their own areas of expertise. Before the experiment, each person had their health parameters taken. One of the most crucial measurements was a DEXA scan - short for dual X-ray absorptiometry - to get a really detailed picture of the amount of fat everyone had and where it was distributed. Other health parameters were measured - resting heart rate, blood glucose, blood lipids, weight, blood pressure and of course waistline measurements. Prof Thompson took on two groups for two types of exercises, while Prof Karpe took two groups for two dietary interventions. The first of Prof Thompson's groups wore monitors to check activity throughout the day and the volunteers were told to eat as they normally would. He gave them simple lifestyle changes to make them more active and increase their daily step count. Prof Thompson's second group was given a classic internet belly-fat fix - sit-ups. Each volunteer did six exercises three times each - every other day over the six-week period. Lie on your back, knees bent and feet flat on the floor, hip-width apart. Place your hands on your thighs, across your chest or behind your ears. Slowly curl up towards your knees until your shoulders are about three inches off the floor. Hold the position for a few seconds and lower down slowly. The third group, monitored by Prof Karpe, was given the task of following another popular online belly fat reduction suggestion - consuming up to three glasses of milk (one litre) a day. Is it time to Make Your Move? Find out about our new campaign promoting accessible, physical challenges for everyone here. There has been research suggesting that dairy consumption might promote fat excretion. Fat comes out in the faeces rather than being absorbed. The fourth group was the diet group. They were not told to change the type of food they ate. Their task was simply to reduce portion size, measuring foods with their hands and fingers. They were also told to cut out snacks between meals. The aim was to make this as easy to follow as possible - if people are given separate meal plans from the rest of the family it can be difficult to follow and more expensive. A dietician supported this group through the process, giving the volunteers coping strategies if they were suffering from hunger pangs. She had individual sessions with everyone at the start and continued to support them during the six weeks with phone calls. At the end of the six-week period, all the participants were tested again on waistline, blood cholesterol, blood glucose and blood pressure. The results were rather revealing. The first exercise group didn't lose any fat, but their health markers vastly improved, with drops in blood pressure and one participant even reducing their blood glucose levels from being in the diabetic range to normal. The sit-up group didn't lose any weight and didn't get any healthier through their parameters. But they did lose an impressive 2cm (0.8in) from their waistlines. Prof Thompson explained that this was due to an improved core strength and the muscles in the abdomen just holding their fat better. A bit like a muscle version of body-shaping underwear. But a good core is beneficial for protection against lower back pain and improves posture. Turning to Prof Karpe's groups - the milk drinkers didn't show any change in weight or health. However although they were being asked to consume an extra 400 calories a day they didn't gain any weight or fat. Prof Karpe thought this might be to do with them being too full from milk to eat as they normally do. The clear winner was the diet-control group. This group lost a collective 35kg (77lb) between them which was an average of 3.7kg (8.2lb) each over just six weeks. Their average waistline reduced by 5cm (2in). The DEXA scan readings were the most interesting with 5% less body fat and an impressive 14% reduction of the dangerous visceral fat inside the abdomen. This group lost overall body fat as well as abdominal fat. They also saw improvements in the health parameters. But they did lose some muscle tone from their legs, which is not a good thing. Thus, the conclusion is that if you want to bust the belly fat in a healthy and effective way, it's the age-old advice of a combination of diet and exercise. Leave the fads where you found them.